When I visited Australia this year for my summer vacation I was eager to dive the much acclaimed Ribbon Reefs and Cod Hole, so I decided to book a liveaboard. This blog covers the decision making on my liveaboard choice and short review of the trip. Check out “The 7 Essentials of choosing a Liveaboard” on how to choose a liveaboard in general. Other operators are the Silverseries, who offer daytrips to the Agincourt Ribbon Reefs and the outer reefs of Cairns (Flynn, Pellowe, Milln). Since that didn’t match my journey I excluded them from my shortlist. Pro Dive Cairns also visit the outer reefs near Cairns and their 4 and 7-day trips to the Ribbon Reefs and Osprey Reef are actually executed by the Spirit of Freedom, so I’ve dropped them too. After some research I found that all 3 liveaboards roughly follow the same route: start at Norman Reef, continue to the Ribbon Reefs and end at Cod Hole (the 7-day tours continue to Osprey Reef from thereon). With 3 boats left on my shortlist it is a fairly straightforward comparison. Mike Ball’s Spoilsport is a high-end operator that has won many awards for best liveaboard. Mike Ball is known to be a passionate photographer and the Spoilsport has various facilities related to this. On most trips an informal photo competition is held. Thus, if you’re into underwater photography, this could be a good match. The Spoilsport is a spacious 30 meter long 3-deck vessel with a roomy dive- and sundeck and it accommodates 29 divers (and 12 crew). Cabins and facilities are good and food and beverages plenty. It has excellent and spacious relaxation areas and it has individual storage spaces for guests. The 4 day/3 night Cod Hole trip covers 12 dives in total and includes a trip flight to/from Lizard Island when you start/end your diving trip. The one hour flight takes you over the reef offering amazing views. When hiring most of your equipment, total cost for a budget/club cabin is AU$1977/$2270 including the flight (breakdown: $1827/$2120 + $18 reef tax + $ 44/day gear hire). There are only 2 budget cabins. Club is one level below “standard”. Nitrox is $25/day (so $75 for the trip). After posting a question on some forums I got positive feedback from several divers, so for me this would be a good choice, although I had some hesitations on pricing. 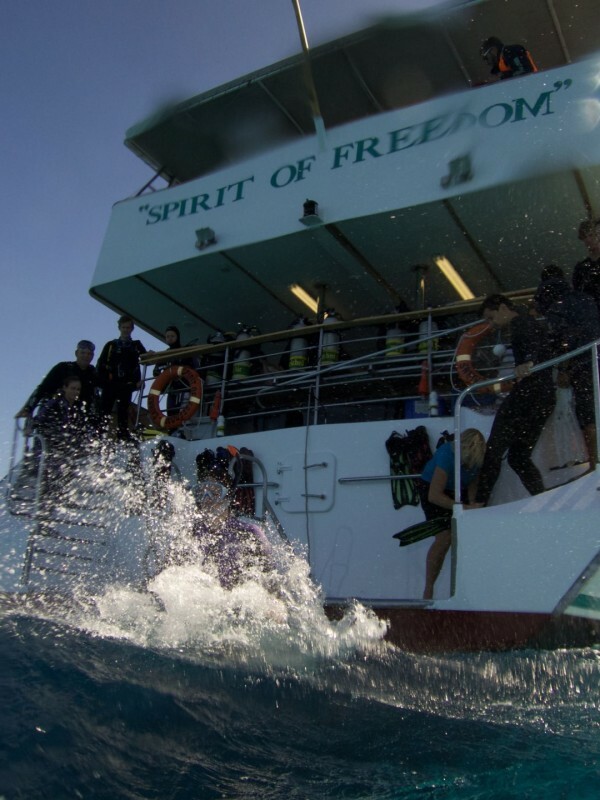 The alternative high-end liveaboard in the region is the Spirit of Freedom (SOF). Owned by two brothers from New Zealand, the SOF has been operating for many years and it has a good reputation. Also this liveaboard was highly recommended by fellow-divers on the internet forums. The vessel is 37 meters long and has excellent facilities. It accommodates 26 guests in total, making it the most spacious liveaboard per guest. All cabins have a bathroom and shower. The common areas include a dive deck, sun deck, restaurant and living room/lounge with a bar. There is plenty of food and drinks throughout the day. The 3 night Cod Hole & Ribbon Reefs trip also ends with a flight from Lizard Island. From there on the Spirit of Freedom continues to Osprey Reef, so when being on the 7-day trip this is your starting point. The last night is spent on board in the bay at Lizard Island with a BBQ. A pickup/drop-off service is arranged to take you from the airport to the city or your hotel. On this trip you’ll have up to 11 dives and prices start at $1670 for a Quad (double/twin 1970). Gear rental is $120 for 3 days, so total cost including equipment is AU$1790/$2090. Nitrox is $75 for the trip. The flight is included. Taka is the “budget” liveaboard option, focusing on certified divers who want to visit the Outer Reefs. The website isn’t very informative: it tells you roughly which dive sites you’ll be visiting at what cost. Taka is a modern, steel-hulled yacht at of 30 meters long, accommodating up to 30 guests with a range of cabin categories. The expansive dive deck features sufficient space with personal storage for each guest, 4 toilets and 4 hot showers, a sundeck, bar and a restaurant. There is Wi-Fi onboard. For the 4 Night Explorer, you’ll pay AU$1570/$1770 (Quad/Twin). Hiring gear is $160, totaling your trip at AU$1730/$1930. If you add Nitrox it’s an additional $120. The boat seems OK and the price is right, so if you are on a “tight” budget this could be a good choice. The lack of information on Taka makes it a bit of a mistery on what to expect, so I was relunctant to book a trip with them. It was a tie between Mike Ball and SOF, having comparable high quality, good facilities and equally good recommendations online. What triggered my final decision was pricing and space. Knowing that both were high-end, top quality, I went for the best deal I could find on the internet which turned out to be SOF (when the budget cabin at Mike Ball isn’t available the price-difference is quite extensive). The crew is extremely enthusiastic and passionate. Chemistry was excellent which I think is the best asset of any services provider. Equipment was in very good condition and after each dive the crew switched your tank. At every dive the crew puts your fins on and rinses your mask, so you’re well taken care of. Professionalism and safety are of the highest standard. GPS/emergency is attached to you BCD, and procedures are mentioned at each briefing and strictly followed. We were with 19 divers, so it was a nice, intimate setting. I shared my quad-cabin (with attached bathroom) with one other person, so plenty of space. The food was amazing! The chef was able to prepare restaurant-style meals, I was impressed. The dives are really good. My favorite turned out to be Pixie Pinnacle, Steve’s Bommie and Cod Hole. Although I wanted to see Cod Hole, I expected it to be overrated, but it is actually really cool to be so close to the huge potato cods. Flying back from Lizard Island over the reef is the icing on the cake after 11 great dives. My schedule didn’t allow me to go to Osprey, so I’ll have to put that on my bucket list for a future trip. Hopefully this has been helpful in choosing your liveaboard in Cairns or Port Douglas. Whatever your choice: it will be fine and enjoy your trip!